Extension Master Gardener Volunteers of Surry County to Host Gardening Symposium! 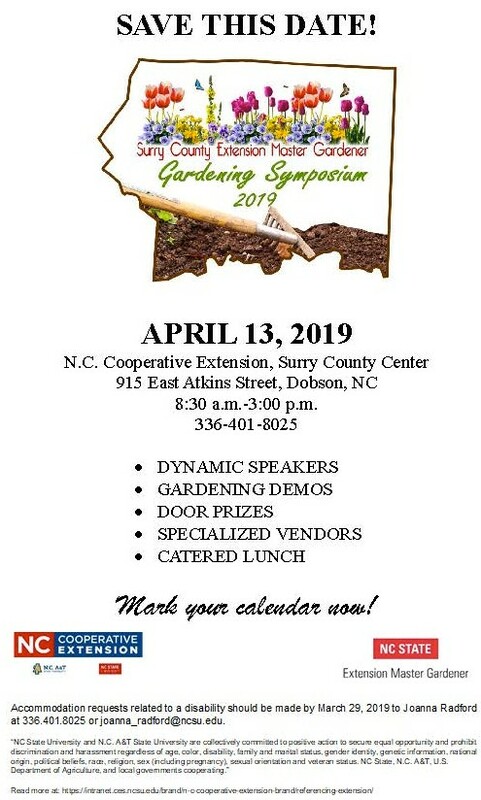 The Extension Master Gardener℠ volunteers of Surry County will be hosting a gardening symposium on Saturday, April 13, 2019! The symposium will consist of dynamic speakers, gardening demonstrations, door prized, and specialized vendors. The cost of registration includes a catered lunch. Mark your calendars now, and make plans to attend this event! Call 336-401-8025 for more information. Save the date for the upcoming gardening symposium hosted by NC State Extension Master Gardener volunteers of Surry County. • Third Annual Turf Research Symposium – Registration Is Open!